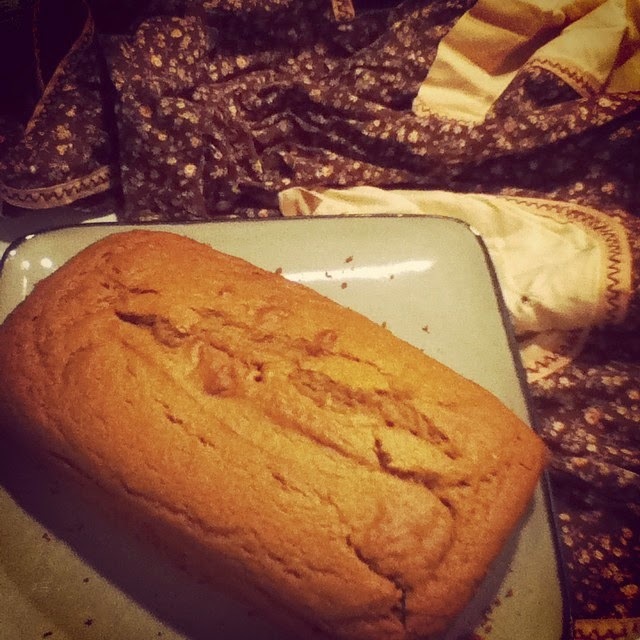 The other day I was in the need of some good, homemade pumpkin bread. So I put on my vintage apron, and got to work making some! Heat oven to 350 degrees, and in a large bowl combine 1 cup of the flour, the brown sugar, baking powder, cinnamon, salt, baking soda, nutmeg, and ginger or cloves. Add pumpkin, milk, eggs, and shortening. Beat with an electric mixer on low speed till blended, then on high speed for 2 minutes. Add remaining flour; beat well. Stir in nuts and raisins. Pour batter into greased 9x5x3 inch loaf pan. Bake in a 350 degree oven for 60 to 65 minutes or till a toothpick inserted near the center comes out clean. Cool for 10 minutes on a wire rack. Remove from the pan; cool thoroughly on a wire rack. Wrap and store overnight before slicing. Makes 1 loaf (18 servings). I accidentally missed the last cup of flour, so my bread was a little bit dense. However, I think that 2 cups of flour might actually be a little too much, so I would recommend a cup and a half. It was delicious and satisfied my pumpkin craving (for now). It also was a good snack to go with tea, and also made a delicious breakfast too! Looks yummy. I've never made pumpkin bread before, I think I'll have to try it.